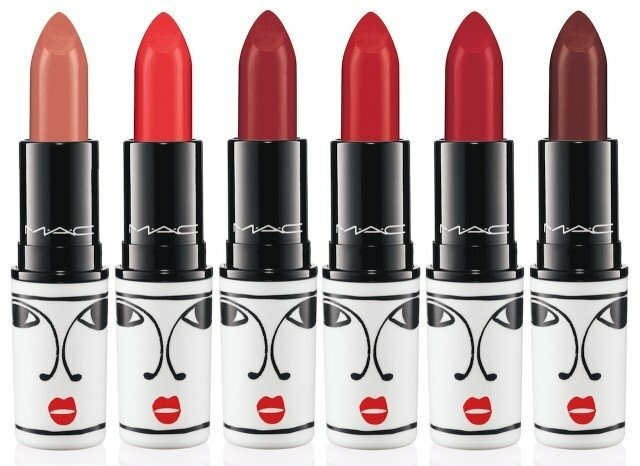 MAC has teamed up with fashion designer and illustrator duo Isabel and Ruben Toledo to design the packaging for the brand’s latest 11-piece collection. The Isabel and Ruben Toledo makeup range includes three ‘Bellgreens,’ ‘Moodyblu’ and ‘Violetwink’ eye shadow palettes (US$44 each), ‘Modern Twist Lash’ mascara (US$23), ‘Intense Eye Liner’ (US$17.50), ‘Tinted Liploss’ (US£17.50, Lipstick (US$17.50), ‘Blush Ombre’ (US$32), Studio Nail Lacquer (US$13.50), ‘129SE Powder/Blush Brush’ (US$38.50) and a Make-Up Bag (US$35). Isabel Toledo launched her first fashion collection in 1985 and is known for having designed the yellow wool shift dress and overcoat worn by Michelle Obama at the 2009 presidential inauguration. Illustrator Ruben ToldeoToledo has created special edition book jackets for Penguin Classics Deluxe Editions of Jane Eyre, The Scrlett Letter, Wuthering Heights, The Picture of Dorian Gray and Pride and Predudice. MAC has described the collection, which is available now, as pairing Isabel’s “sensational penchant for colour” with Ruben’s “vibrant energy.” The white packaging features illustrations of graphic lines and red-lipped faces.